If this looks familiar to you, then you know why a Bronx-centric crew of emcees and deejays called themselves Diggin' in the Crates. I shopped around at a lot of office stores, secondhand stores, and even grocery stores looking for mine. I would literally roll up behind a milk truck at the grocery store, hop out and yell at the delivery guy "Hey!! Got any extra crates you don't want?" Because if you had records, and you had to TRANSPORT records when playing gigs, you had no better choice than a durable milk crate or a well made imitation of one. 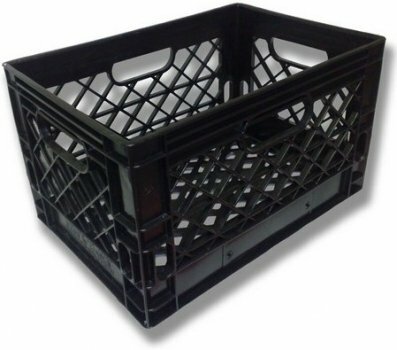 Kelis might disagree but a well organized milk crate could bring all the boys AND all the girls to the yard. I speak only for myself but I couldn't do a show in college radio without lugging at least two from my dorm room to the studio. I wasn't content to just spin the platters that were in their collection, I wanted to make my OWN selections. And as low as I was on the totem pole of turntablists (I'm not even fit to kiss Grandmaster Flash's boots) nothing beat the satisfaction of putting a Biz Markie instrumental on the left and a Wu-Tang acapella on the right and running U-God's vocals back and forth under the needle: "My hip-hop will rock and shock the nation." If I didn't have my crates, that wouldn't be possible. If I didn't have my credit card and the help of Sandbox Automatic, FILLING those crates would not have been possible. (Boy did that card take a hurting!) I supplemented that with whatever rummage sale records I could get and deals made via Usenet newsgroups. Crates are like rabbits - they multiply quickly. After college I lacked the free access to high quality Technics turntables that I had in the studios, and the demands of paying rent on an apartment and the interest on all those CC charges kept me from continuing to deejay. I could have run up my card further to invest in some good equipment, but I also decided that I had to be real that I started way too late to be ever be at the level of DJ QBert or Roc Raida (may he rest in peace). Del once said emcees need to know their limitations, and deejays do too. I never gave up my crates though. I lugged them from room to room, from state to state, from apartment to apartment. 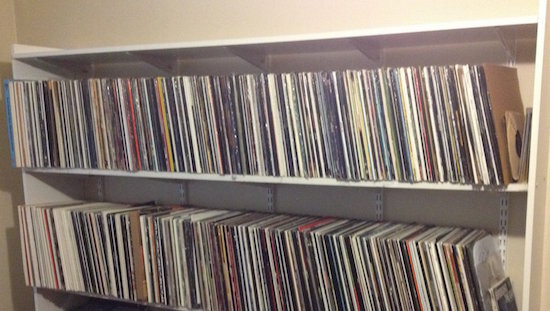 People talk about the "warmth of vinyl" compared to digital media like compact discs or MP3s. People talk about the larger artwork on the jackets and the creativity of the inner foldouts on double or triple albums. All those things are true - and yet completely irrelevant to me. I wasn't giving up on my records for love or money. I sold exactly ONE in college when I thought I had too many and I regret it to this day. I love my records. Even if they're scratched up or beat up, they're in my heart. I even still have slipmats that say "Ras" and "Kass" for my 1's and 2's, and though I'll never be worthy of them, I'll never part with them. They're a set. So are my records. Once you go vinyl, you never go back. I came to a realization not long ago though - I no longer need the crates. I don't "dig" through them any more randomly hoping to find one thing to listen two, or two things that would go great together. I'm now 20 years + removed from that part of my life. In fact those milk crates I was so fond of and attached to were now actually a burden. They were taking up valuable floor space. You can't set a crate on top of a crate, or the weight of the records on top would bend and warp the ones underneath. On top of that it's not fun to not know where something you want to listen to is. If digital albums have spoiled music listeners in any way, it's that you can easily sort your music by title, by genre, by rating, or even by length. That's pretty hard to do with a milk crate full of vinyl. I was no longer digging my crates and something had to change. NOW.